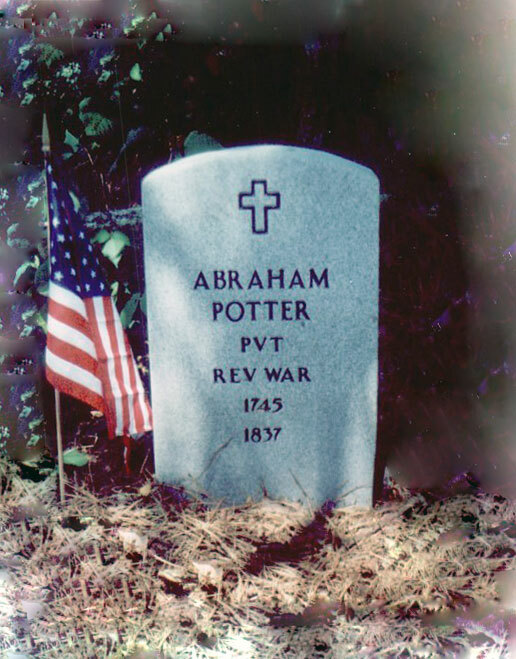 First listed here is the information that is available for Revolutionary War Soldier, Abraham (Abram) Potter b 1745 Bladen (later known as Anson then Rowan) Co NC at the following Source link: Rev War Soldiers for NC and SC. 1780, a Private under Capt. John Armstrong and Lt. Col. Joseph Phillips. 1780, a Private under Capt. Joel Lewis, attached to Lt. Col. Drury Ledbetter (Montgomery County Regiment). 1781, a Private, Captain not named. Born 1745 in Bladen (what would become Anson then Rowan) County, NC. Battles - Hanging Rock (SC), Camden (SC), Cowpens (SC). Pension Number: S. 30657 - under the act of June 7, 1832. State - North Carolina; Period when service was rendered: 1777, for 2 years 6 months. Private under Capt. J. Armstrong and Col. . . .? Phelps/(Also shown as Phillips). Hired as a substitute in 1779. Age at present — 88 (eighty-eight years). Place of abode when service entered: North Carolina. That he enlisted in the army of the United States in the year 1777 under the following named officers and served as herein stated. He first enlisted under Capt. John Armstrong of Surry County, North Carolina in August and served a tour of two years and six months. The name of the Commander of the Regiment, being the 7th Regiment was Joseph Philips/(Phelps) who I think served . . . (illegible) joined Gen. Green's Brigade . . . (illegible), and marched from Surry County to Salsbury in same State from there to Georgetown, there we had a small battle with the Tories and they retreated. From there we marched to Randolph by way of Willmington, then we took four or five prisoners, from there we marched back to Abbott's Creek. There we came in contact again with the Tories and took four more prisoners, one of which was a Captain by the name of Philip? Culbazer? (sic) we again returned in obedience to the orders of Gen'l Campbell to Salisbury. There we lay in port for about a month. From there we went to South Carolina to a place called the (Snow?) Camps?, then marched to a place called the (Thrice?) Runs upon the road leading from Charleston. There we had an engagement with the British and Tories in which many were killed and taken prisoner. Then we marched to the Hanging Rock, there we had another engagement with the British and Tories in which we succeeded and took their waggons (sic) and their baggage and from there we marched to the Cowpens, there we had an engagement with the British in which we suffered much loss, many killed and wounded, Capt. (Britt?) was wounded but did not prove fatal. From there we marched near Camden, there we joined Gen'l. Green's Regiment and there we had an engagement with the British in which many were killed and wounded. From there we marched to a town about thirty-five miles from Charleston, upon the waters of the Peedee River, after sometime we marched to Rugsby's mill, there we had an engagement with the British in which Gen'l. Gates was defeated also he flu (flew?) and (illegible) Cab was killed. We again got together at the crossroads and marched to the Dan River by way of Salisbury and there I received my discharge from Lieutenant John Harper which discharge was burnt. And in the year 1779 I substituted in the place of David Stewart for eighteen months. Then I was in the (illegible) in the Moravian town under Gen'l. Armstrong, then we marched by Wilkes Courthouse up to Bushs (illegible) and then came back to Surry Courthouse. Then I enlisted Thomas Sarten in my place during the war. My Captain's name was Joel Lewis and William Lewis was my Col. and then I returned home. He states that his memory is much shattered and (illegible) owing to his age and he cannot recollect positively as to time. He hereby relinquishes every claim whatever to a pension or an annuity except the present and he did (swear)? that his name is not on the pension roll of the agency of any State. Sworn to and subscribed the day and year aforesaid. Abram (his X mark) Potter And the said Court as hereby declare their opinion that the above named applicant was a revolutionary soldier and served as stated. I, John D. Mims, Clerk of the Court for Pike County do hereby certify that the foregoing contains the exact? proceedings of this court in the matter of the applicant of Abram Potter. In testimony whereof I have hereunto Set my hand and Seal of Office this 26th day of November 1833. 1 . Where and what year were you born? Answer: I was born in Rowan County, North Carolina in the year 1745. 2. Have you any record of your age and if so, where is it? Answer: I have, and its at my son John's. 3. Where did you live when called into service? Where have you lived since the Revolutionary War and where do you now live? Answer: In Surry County, and the State of North Carolina and have since lived in Kentucky and do now live. 4. How were you called into service? Were you drafted? Did you volunteer or were you a substitute, and if a substitiute for whom? Answer: I enlisted under Capt. John Armstrong for two years and six months and a substitute for David Stewart under Capt. Joel L (illegible but his name was Joel Lewis) for eighteen months. 5. State the names of some of the Regular officers who were with the troops where you served such as Continental and Militia Regiments as you can recollect and the general circumstances of your service. Answer: Genl. Martin Armstrong, Col. Wm. Lewis; Major Joseph Wuston? ; Capt. Joel Lewis, and Micajah Lewis, Lieutenant. He states he enlisted in the year 1777 and went against the British and Tories and was in engagements and in 1779 received his discharge, which discharge was lost. 6. Did you ever receive a discharge from service and if so, by whom was it given? Answer: I received a discharge from John Harper, the Commandant for the first tour, the last I did not get any. 7. State the names of persons to who you are known in your present neighborhood and who can testify as to your character, for your veracity and their belief of your service as a soldier of the Revolution. Answer: William Ramey, Esqr. ; James Roberts, Esqr. ; William Tackett, Esqr. ; Thomas May, Esqr. ; William Ratliff, Jr. and Thomas Steward.